CSM scores 2 goals in each half to beat the Central College Dutch from Pella, Iowa, 4-1. 2 goals in the first half and 2 in the second. The first goal, MelissaKing just basically took the ball and dribbled straight through the Dutch defense and beat the keeper. The second goal (by King again) came off of an assist by RaeLeigh Withey who played a beautiful little through ball to beat the defense deep in the box. Sara Berens opened up the scoring in the second minute of the second half by knocking in a great cross from Katie Archibald, who beat a player on the left side and crossed it. The Dutch got on the score board in the 53rd minute when our back line was trying to push up and left Central's Hasken onside. Molly Jones came out strong and missed and Hasken slotted it in. Melissa King got us back our 3 goal cushion on a header from a great cross by Kira Cross. Sara Berens was there at the back post but the ball proved too tall for her. King was positioned at a good angle behind Sara and was able to put it away, earned a hattrick. CSM finished with 34 shots. Swanger was in goal in the first half and made 2 saves. Mollie Jones was keeper in the second have and made one save. Central College finished with 3 shots per half for a total of 6. Their keeper made 23 saves. A good outing for CSM..Next game is in McPherson, Kansas on Thursday. King scored on a breakaway(Archie assisted) 2 begin per. 2. We let Clarke bk in w PK in 74th min. Had great opportunities,didnt finish. Right now the Flames are just finishing up having dinner at Red Robin in Dubuque. Tomorrow we play @ Clarke, 1 PM on campus. Ready to rock! CSM, 1 goal (sau og) SAU 3 Goals by dexter in 32nd min, by Dresden in 64th, Perkins in 71st. Shots CSM 4, Sau 21. CSM Saves 14, sau 4. King pressured SAU in2 an own goal in the 6th min but were unable to deal with SAUs long throws and gave up 3. CSM came out on fire, cooled a bit, tripped and finally eeked out a victory versus Concordia on a muggy Saturday afternoon. Ramsey Miller scored off of an assist by Katie Archibald in the 3rd minute. That would be the 5th time in 7 games that CSM has scored in the first 12 minutes of the game. Things were looking pretty good until Katie Archibald drew a red card for a foul off the ball. Katie said that lost her composure and she retaliated after a player fouled her. CSM then had to play one player down for the rest of the game. Katie will also have to sit out the next game. Red cards don't happen too often in the women's game and our players had little experience with it. We were a bit confused for awhile but ended the half up 1-0. At halftime we told the players to remain calm and composed. The only difference was that we would just have one forward--everything else we play the same--no time to panic. The important thing was to keep possession and try not to just send hopeful balls forward. Less than 10 minutes into the second half, RaeLeigh Withey lined up a free kick about 10 yards from the center line. I told her from the sideline to focus and get the ball in the net. Rae stepped to it and struck it clean. It then sailed high in the air and dipped into the upper 90 to give us a 2-0 lead. The keeper had no chance. We made things interesting in the 69th minute when Keeper Jackie Swanger had the ball at her feet, tried to cut it back at the top of the box and tripped. With pressure on her, Swanger tried to play the ball out but it went to the feet of Concoria's Ford who put it in the back of the net to make the score 2-1. We then buckled down and kept a lot of possession and had a few more good chances on the goal. Defender Jessie McLaughlin almost scored her first career goal on a corner kick. With about 3 minutes to go, we weren't trying to attack, just hold the ball in their end when we lost it and Concordia crushed it forward, catching our back line flat footed and the race was on. Swanger came out, missed the ball and Hilary Brown cleared it off of the line. Concordia had 2 corners in the last 40 seconds but we were able to survive. Whew! A lot of positives came out of this game. We learned that we can deal with adversity and still be successful. 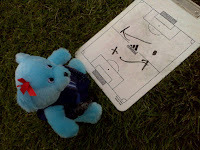 We learned that we can change our style of play and keep possession when we need to. We learned that if we play as a team, we will survive. We are taking steps forward. We do have a few things to work on--but I am sure we will attack our shortcomings with intensity. CSM goals by Sara berens & Melissa King. Down 0-2 in 2nd half, CSM cm bk w 2 goals but ran outta gas. CSM outshot Dordt 20-15. CSM Tripped up by Morningside. Monday, September 9 was Labor Day but the Flames didn't get the work done that it needed to and fell to Morningside 2-3. The Flames started fast with Katie Archibald scoring in the 2nd minute from an assist by Jessie McLaughlin. Katie beat the keeper with an awesome shot that sneaked in at the far post. Unfortunately, we failed to maintain our discipline defensively and Morningside's Turnipseed was able to score off of a counterattack in the 24th minute. CSM went ahead 2 minutes later when King beat the keeper off an assist by Archibald. Things looked good for a couple minutes then (OOPS) Morningside caught us twice with counters in the next 10 minutes, with Swotek and Hauptman beating CSM's Mollie Jones. The first half ended with CSM down 2-3. The Flames had 16 shots in the first half with Morningside having 8. In the second half, CSM came very close numerous times, but was unable to find the net. CSM completely outshot Morningside 27-12 ( Morningside only having 4 shots in the second half.) A couple times the Morningside keeper dropped the ball on saves, but we weren't there. We had some excellent crosses, but mistimed the box runs or we didn't fill the box. We had 6 corner kicks (Morningside had none) and we came very close, but no joy. We were one-on-one with the keeper maybe 4 times, but came away with nothing. It was frustrating. Keepers: Jones played the first half and made 4 saves. Swanger played the second half and made one save. Hopefully, we will learn from this experience that we have to play a disciplined 90 minutes of soccer. It ain't over until it is over. Next game at Dordt, 3 PM on Sept. 9. The game between CSM & MLC today has been cancelled due to rain. The Flames beat Northwestern on Monday, October 31 by a score of 2-0. Goals by Melissa King and Sara Berens, both in the first half. Ramsey Miller assisted King's goal and King assisted Berens goal. CSM outshot Northwestern 34-3 in a game dominated by the Flames possession. Swanger, the CSM keeper for the match made 2 saves in the first half and was untroubled in the second half. I was pleased by the way the team responded the day after a physical game with DWU. We really made the ball work for us and didn't run ourselves into the ground. The next game is vs Midland Lutheran at home, 5:00 PM on Thursday, September 3. We did have a game scheduled for Saturday but that one was moved to October 10. We do have a game against Morningside on Labor Day at 5.